When you are designing your company, you need to understand how you’re going to differentiate yourself versus the competition. There are three options for competitive differentiation: Price, Product, or Convenience. These create the Competitive Differentiation Triangle. The middle of the triangle is the “No Fly Zone” because there are no profits to be made in the middle. Having a clear understanding of how your brand is positioned on the triangle will guide your pricing strategy, investment strategy, and marketing strategy. All of those will ultimately lead you to your overall strategy for being profitable. The key is to not do all three. If you do all three then you are trying to give away the best, most convenient products. This strategy means happy customers, but no profits; which will eventually mean no more business. Successful and exceptional companies choose to differentiate on one or two of Price, Product or Convenience. If you are trying to be the best in the world at all three, then you are trying to give everything away for nothing and are on track with many companies you’ve never heard of because they’re all bankrupt. Differentiation in one of these areas will drive your strategy for profitability and where your focus should be put in order to increase profitability. Figure 1. Competitive Differentiation strategy focuses on one corner or one side of the differentiation triangle. We can place a lot of today’s exceptional companies on this triangle. Keep in mind that we are focused on how companies differentiate. If a company has aspects of an area, that is not the same as having differentiation compared to their competition in that area. Apple comes to market such a level of product excellence that everyone forgets the iPhone was NOT the first smartphone, the iPod was NOT the first handheld music storage device and the iPad was NOT the first tablet. Crazy huh? Differentiation on Product has created astonishing financial performance and customer loyalty. Apple is obviously a Product differentiated company. They are definitely not working on Price differentiation. I would argue that they are not differentiated on Convenience either as long as we don’t confuse ease of Product use with Convenience. They only truly differentiate on ONE of the competitive strategies. Walmart is obviously a Price differentiated company, with a secondary focus on Convenience. Their slogan is “save money, live better”, and Sam Walton’s Rule #9 for building a business is “Control your expenses better than your competition.” They are always consistent on Price first and foremost, second on Convenience through availability. I wouldn’t ever say that the shopping experience at Walmart is about the quality of the shopping experience. CVS is obviously a Convenience differentiated company. They put their stores any and everywhere and the biggest boldest words on CVS.com at the time of this writing are: “Your pharmacy is always open.” I’m not sure that I would say that they have another focus. They’re definitely not competing on Price (milk and prescriptions are much more expensive at CVS than Walmart), and I’m not sure I’d say that the quality of my drugstore experience at CVS is exceptional, it’s OK and sometimes nice, but not exceptional. I love being a customer of Amazon because they’re not making money on me. Amazon is a tricky one. They started as a low price leader and are now walking the tradeoff between price and convenience. In truth, I first said they make no money, which is still true from a margins perspective. Amazon is not the lowest price on a lot of things anymore. When they started as a price leader, it was inconvenient to wait a week for your product to arrive. Then Amazon introduced Prime in a move towards convenience. But many Prime items are more expensive than their counterparts from other box stores and sites with slower, less expensive shipping. They’re definitely more expensive than AliExpress items that ship from China. Amazon’s size makes them seem more profitable than they actually are. As of January of 2017, Amazon’s lifetime cumulative profit since it went public nearly 20 years ago in 1998 is less than Walmart made in the first 6 months of 2017. And to make matters more interesting, more than half of that profit was solely from Amazon Web Services (AWS) in the year 2016. I would encourage you to choose your strategy and make sure you refine your company around that single competitive differentiation. If you are going to compete on anything besides Price you need to find a way to not be the cheapest option on the market. If you are going to compete on Product and features, then you need to have a solid R&D and technology funnel and use Market or Value-Based Pricing approaches. If you are going to compete on Price, then you need to focus on operational excellence so you can lower your costs and offer some level of Cost-Plus Pricing and occasionally price-leading Market-Based Pricing if your costs are world class. If you are going to differentiate on Convenience then you should focus every single thing you do on making customer interactions easier and better than anything they’ve experienced before. 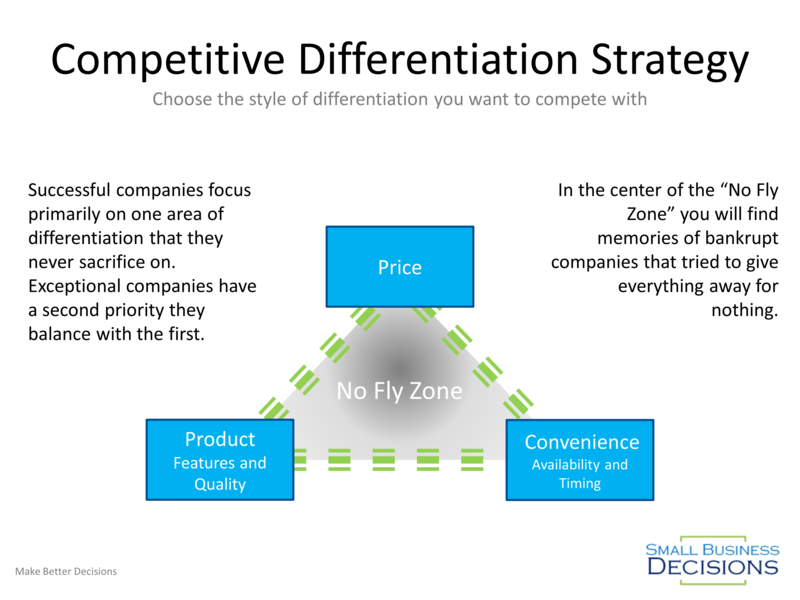 Once you have chosen your Differentiation Strategy, let’s talk about how to optimize each area based on whether it is an area of differentiation or not. 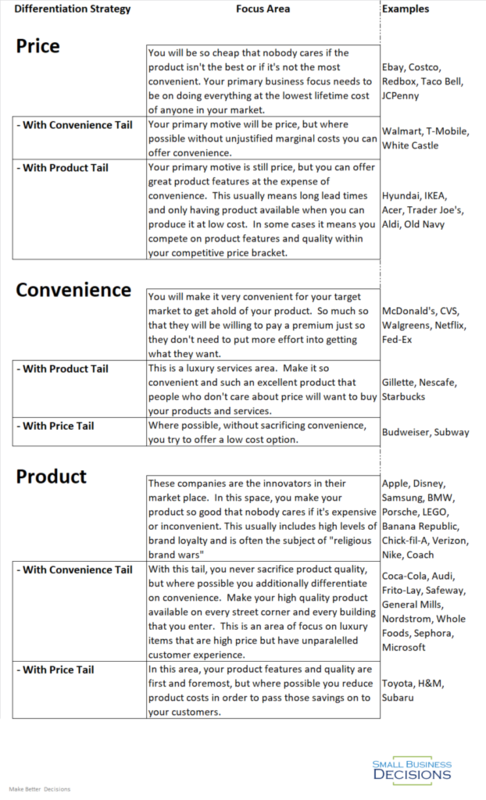 You can view the table below and look at what strategies are available and what popular brands might be a good example from an operational and differentiation standpoint. As you’re trying to choose a strategy, look at some of the things those leading brands are doing well. What are they saying in their 10K’s? What advertising are they doing? Does their advertising make sense with their overall brand strategy? Table 1. Competitive Differentiation Strategy with examples of the primary business focus area and popular brands which may be an example of operations with that strategy. Don’t confuse freemium revenue models with competing on Price. In the end, your premium features are not going to be cheaper than the next business that offers the same services. If they are, then you probably should not be using the freemium model unless that’s somehow the industry norm. The purpose of the freemium model is to hook customers in so that switching costs are higher than the premium price you charge for your products. What about the Advertising Revenue Model? In this model, you focus on having a great free, convenient product for consumers, but only so that you can charge a premium price for advertising. This model creates two separate customer pools and it’s important to differentiate how you see those when looking at your product strategy. For your consumer customers, you’re focused on whatever it takes to get enough engagement. For your advertising customers, you’re focused on the best Product: targeted buyers that are worth a premium price for advertising. It is critical that your entire company be aligned with this overall strategy. Your marketing, investment, pricing, and R&D departments need to understand how you will be different within your market. It completely changes how you do each part of each function. This approach ensures that you have a cohesive approach to capitalize on your chosen method of bringing value to market. How Much Can You Pay Yourself as a Business Owner? That is very attention-grabbing, You are an overly skilled blogger. I have joined your feed and sit up for in the hunt for extra of your magnificent post. Additionally, I have shared your web site in my social networks!